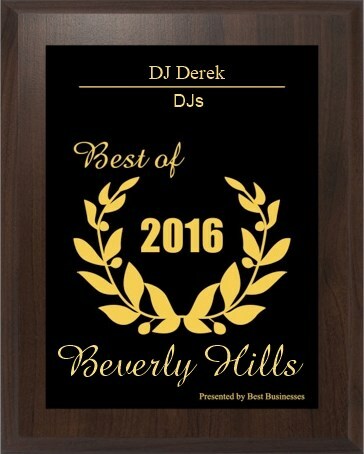 A LOS ANGELES based, full-service DJ/MC that specializes in Weddings, Corporate Events. Whether you're having a small wedding at your home or a company party for 2100 people, we are the disc jockey for you. We have the equipment, music and Master of Ceremonies for a perfect celebration. In need of party favors? We have access to hats, glow necklaces and much, much more. Including caterers, tarot card readers, airbrush tattoos, photobooths and espresso bars. No event is too small or too big. Karaoke also available!!! An experienced and seasoned DJ who can read your crowd and play what's appropriate. A relaxed and well spoken MC whose comfortable making all of your announcements. For a quote please call or email us today.